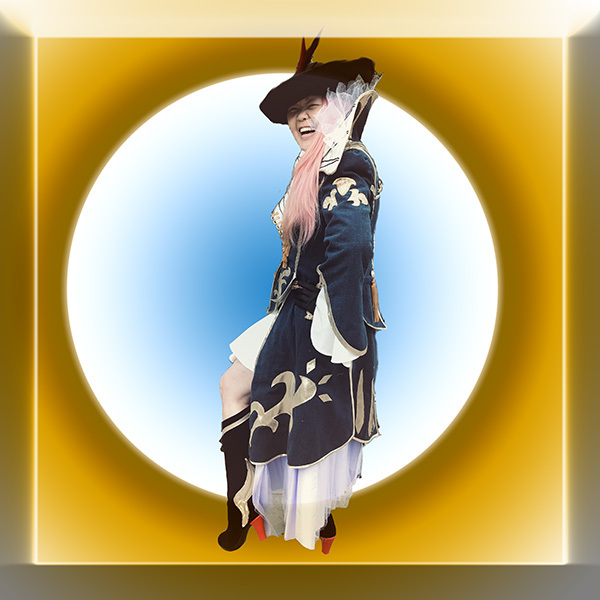 Are you ready to be a Warrior of Light and defend your Empire? I loved working on this project! As a designer there is nothing more challenging or satisfying than bringing a costume to life which has never been made before. Often times an artist may create a sketch of a character without thinking how this can translate onto the human body. 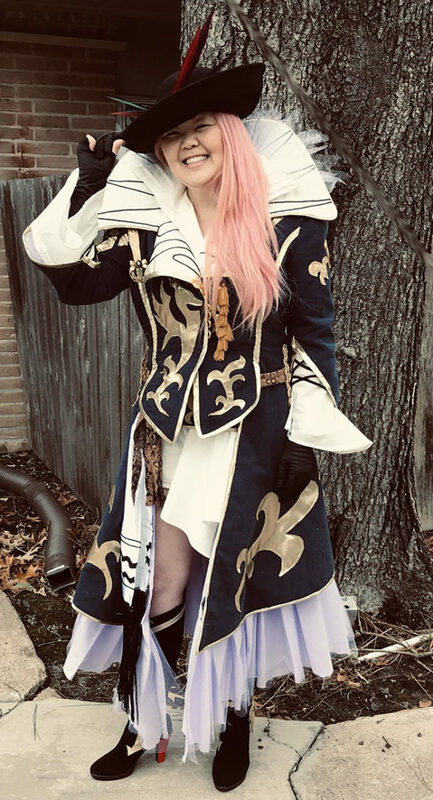 The challenge was to create something wearable and functional but to retain the “character” of the Bard and I was deeply honored to bring her Fantasy Bard’s costume into reality. So here is the story of how I brought the Bard to life! 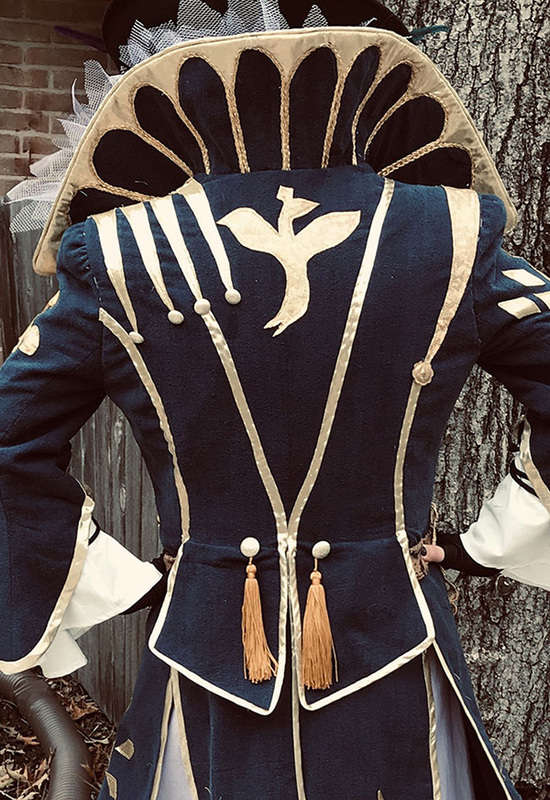 My client and I worked closely to bring her Bard’s costume to life for her to wear at the FanFest in Las Vegas. The Bard’s costume featured a series of organic and inorganic fabrications that help bring her character to life. For the organic effect I selected some unusual and hard to find fabrics including silk noil, trimmed with vintage Peau de Soie and wool Challis. There fabrics which are very hard to find or no longer manufactured. I coupled this with more contemporary futuristic materials such as holographic Mystique spandex for the appliqués. At her fitting. The fantasy unfolds! Much attention was placed on the details in order to replicate the character’s costume as accurately as possible. 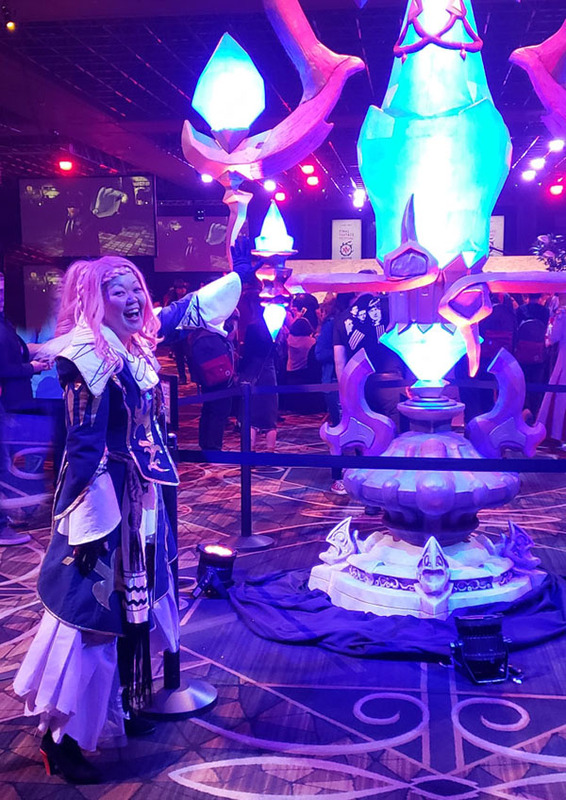 Find out how I can create a custom costume fantasy for you too! 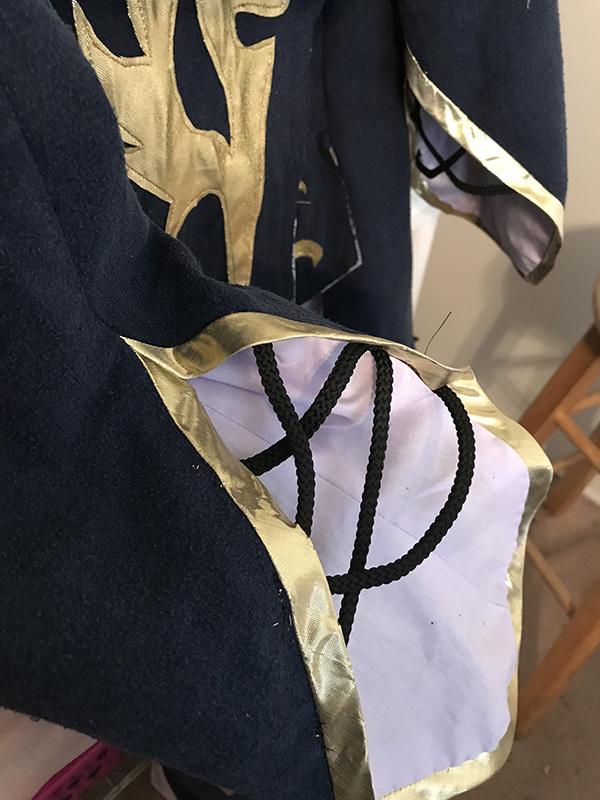 Sewing Boot Camp Halloween Special Edition! Stuck for new ideas for your Halloween Costume? 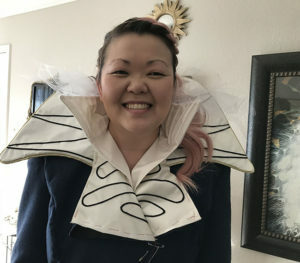 Do you feel challenged by your current Halloween costume project? Don’t despair! 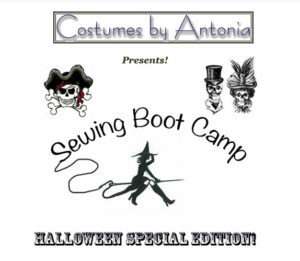 The Sewing Boot Camp Halloween Special Edition is your go to place for all of your costume needs. Bring you projects, your questions and your imagination for a day of fun and creativity. Cost: $55.00 per person advanced registration only via credit card or PayPal. Posted on September 30, 2016 Categories WorkshopsTags Costumes by Antonia, Halloween Costume Workshop, Halloween Costumes, Houston Texas Sewing lessons, Learn how to sew, Sewing Lessons WorkshopsLeave a comment on Sewing Boot Camp Halloween Special Edition! 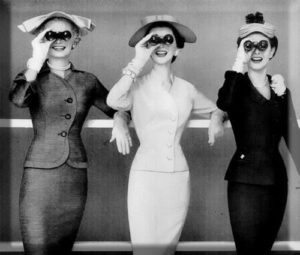 In the Fashion Food Chain a “Knock Off” is the duplication of an existing design in a similar fabric. In this workshop you will learn how to create a pattern “knock off” from an existing garment. Do you have a certain article of clothing you love and wish you could have it in more colors? Now you will learn how! This is an all day workshop specifically for sewing enthusiasts who wish to take their skills to a whole other level. Click on the image to learn more! Can’t wait to click? No problem call me directly for information and registration: 832-652-9180. Hope you can join us! Link not working? No Problem! Posted on September 30, 2016 Categories WorkshopsTags Advanced sewing workshops, Clothing Knock offs, Costumes by Antonia, Houston Texas Sewing lessons, Knock off workshops, Learn how to sew, Sewing Lessons Workshops, Sewing workshops Houston TexasLeave a comment on Knock it Off!